Welcome to Ralph Trynor's site. Let me do the hard work for you. Here are some of the services I offer. Custom Computer Design: Tell me what you want to do and I will design a system that best fits your needs. WEB site for your business: I can design and host your web site at a very reasonable rate. Roku: Need to be on Roku then give me a call. A brief history of my online experience. 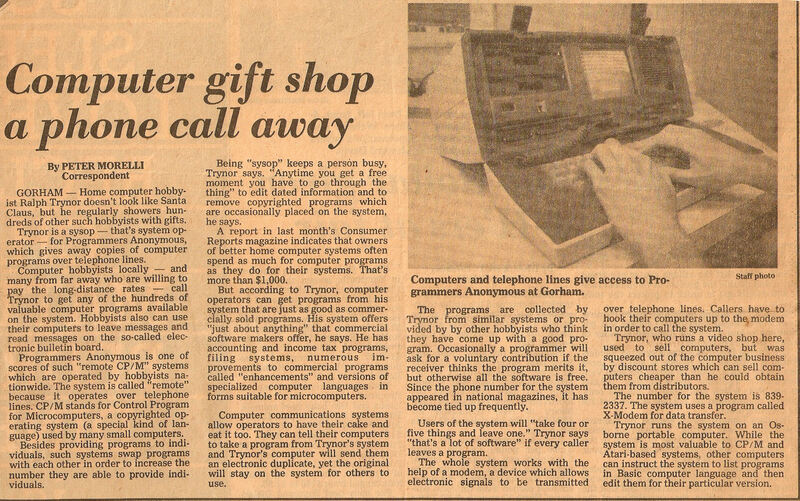 When I first started a system so people could get online it was with an old Atari 800 computer. It only had a 5.14" floppy from but I soon made the hardware and software to interface two 8" drives. A few years after that Adam Osborn cam out with a cp/m system. I then within a short time came up with a way to interface a 10 Meg hard drive. Go ahead and laugh but 10 megs was a lot back then. At one point my system had 500 megs of hard drive space and 20 cd-rom drives connected with software and games for people to download for free. Remember this was all before the internet was around for the average person to get on. Once the internet did arrive when people called one of my 20 plus phone lines they could get on the internet much like you do with AOL but there was no AOL then. I was the first person in the state of Maine that offered users a way to get to the internet. The Wizard's Realm (by Wizard Software) Public Online Service (POS) was started in 1979. 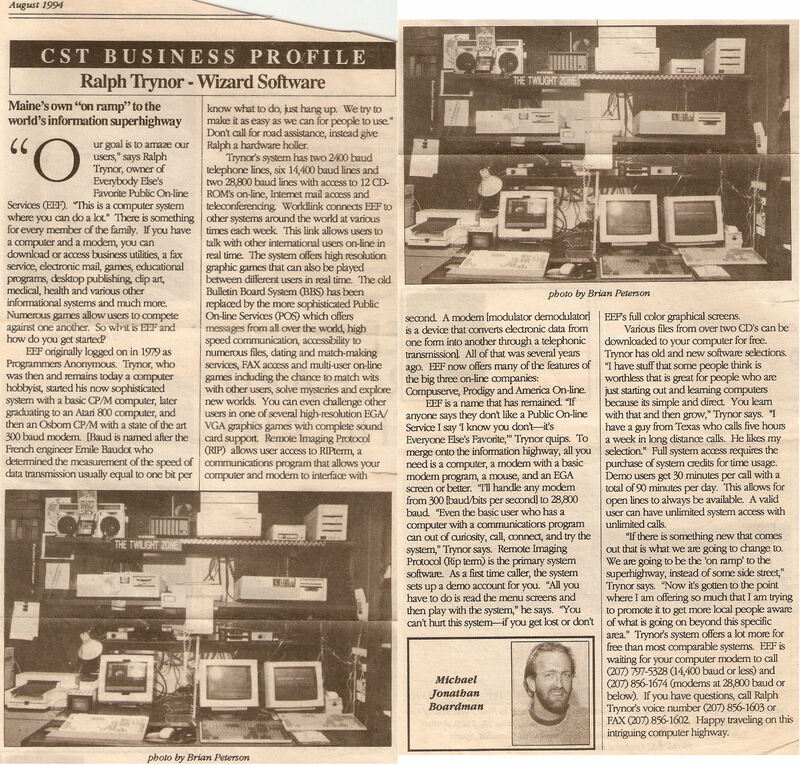 It began with 1 line at 300 baud :) Since then it has grown to serving your many needs and have added many services ranging from business to entertainment. In it's day he Wizard's Realm offered everything from E-mail, CHAT, Interactive games, as well as Interactive Dating services, and much much more before the internet was even known by most people. Before people could surf the internet the could go to The Wizard's Realm via a phone line. At one point we had 20 plus lines. What that meant back then was 20 plus people could connect together with their computers to play games, chat and swap files. By today's standards with the internet that seams small but when I first started this is was huge. The phone lines where published in magazines and books all over the world. that is how people would find out about these systems. I had people calling from all over the US even from Alaska. There where even people call from over seas. Most long distant callers back then worked for large companies that footed the bill. There was a network of us that did this from all over the country and we would connect together to share forum files. This meant that people could leave a message that others could read and respond to. I belonged to a group of programmers that use to program games that could be played with sometimes up to 200 people at a time. Again this seams small but remember there was no internet back then and the modems where very slow. I remember thinking when I got my first 2400 baud modem that it flew :) Compare that to today's 56k baud modems. That's a 2,400 to a 56,000 and now Hi speed internet is here. The Wizard's Realm was also at one time called Programmer's Anonymous. So it you search the web you may just find articles about them. Do a search using quotes "Ralph Trynor" and you may find some old items or listings on these systems. Click The Wizard's Realm link below to see one of my OLD pages from the original Wizard's Realm in the 80's before AOL came along. Some Terms used on the Internet.! Some "http://www.old-time-tv.com/images on this system are Copyright Wizard Software/ and can not be use on any other system without permission in writing.